In my last article I gave you thirteen tips to get the most out of your Volca Sample, using both tried-and-true sampler techniques and the special capabilities of this surprising little unit. Now I will go one further and show you how to turn your Sample into a synthesiser. How is this possible? Well, we actually have two different methods. Additive Synthesis creates distinct timbres by layering sine waves of different amplitudes and frequencies. This is easily done in the Volca Sample by loading in a handful of sine waves, spaced an octave apart. A sequence utilises up to ten parts, each at its own pitch. We have full control over amplitude, pan, and envelopes, and so could certainly get some variety by summing ten sine waves. I encourage you to try this, if only to discover the limitations. Ten overtones is not that many, and the requirement to fine tune every component becomes tiresome for the limited variety of sounds that result. The entire Volca is then devoted to one timbre, which is rather limiting. The second method is much more versatile. 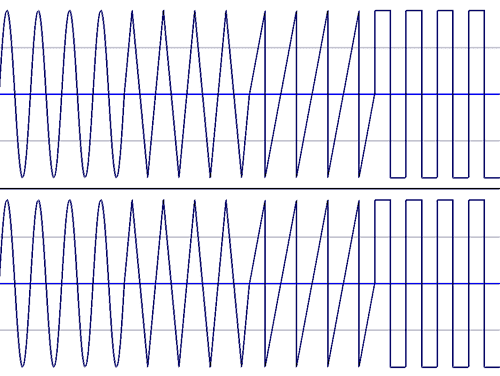 Wavetable Synthesis involves scanning repeatedly through a waveform, so it can be replicated over time. The Volca Sample has a Loop function, so all we need to do is load up samples that represent waveforms (rather than complete sounds). Then we can use the techniques mentioned in the last article to play these continuously. The resulting synthesised textures are perfect for pads and ambient music. Where do we get waveforms? Well, it's easy enough to sample sounds down to their constituent parts, or even draw a waveform in an audio editor, freehand. But there are also plenty of ready-made resources. For example Kristoffer Ekstrand, under the stage name Adventure Kid, curates a large collection on his website. The Adventure Kid Waveforms (AKWF) are single cycle waves, 600 samples in length. At the native 44.1 kHz each amounts to 1344 bytes. At the Volca Sample sampling rate of 31,250 Hz, this is only 996 bytes. At just under 1 kilobyte each, we could in theory fit 4000 waveforms into the 4 MB of sample memory. The problem is we have only 100 sample slots. If we could group 40 waveforms per slot, they all could fit. The graph at the top of this article illustrates the principle. This sample has four repetitions each of sine, saw, triangle, and square waves. Four waveforms fit in one sample. Recall from the last article that we can alter the "Start Point" and "Length" of a sample. I explained how we can set the same Sample in multiple parts, each using a different segment. Perhaps we can use this method to access different waveforms within a single sample. The resolution of these controls presents a practical limitation. According to the Korg cheat sheet, "Start Point" can set the playback point "within the range of 0% to 90% of the total length of the sample". The control increments over the range 0 to 127. So, when the display reads "0", we are at the start of the waveform. When it reads "127" we are 90% of the way to the end of the sample. Each increment represents about 0.7031% of the total. Likewise, "Length" sets a "range of 1% to 100% of the original sample length", relative to the starting point. Each increment here represents 0.7795% when Start is set to the Sample beginning. But it may represent a different amount if it varies with the Start position. Sheesh! This scheme isn't very helpful. If I could ask for a firmware change, it would be to change the increments to match exact divisions of the file. "Start Point" would run from 0 to 90 and "Length" from 1 to 100. Each tick would correspond exactly to one percent. Since we aren't going to be able to access precise points, our wavetable synthesis method is compromised. Nonetheless, let's persevere. I doubt any of us needs 4000 waveforms. Instead, I propose assigning a smaller number of waves to each sample. To start with, we could take one waveform and repeat it four times to get a longer expanse. This might avoid glitching at boundaries, given the strange percentage divisions we must dial in. Combine this repeated waveform with another likewise extended waveform. Do this four times. So now we have one file containing four repetitions of four waveforms. Use Vosyr to save this to a sample location on the Volca hardware. Here's that image again, which illustrates exactly the scheme as described. Now you can unplug from the computer. On the Volca, choose the first part in a blank pattern. Select the sample corresponding with the mutant file you've just loaded. Turn Loop on, and normalise all the other controls. Which is to say, return them to their default values. To dial in the first waveform in the sample, set Start to 0. You should hear something approximating the original. It won't be exactly the same, since are cycling over repetitions of the waveform. Besides, the reduction in sample rate may have compromised the sound. Choose part 2 and choose all the same values. Most will default to the same, but make sure Loop is On and the correct sample is chosen. Now, dial in the second waveform in the sample by setting Start to about 30. Slowly increase until you hear the correct wave. Choose part 3 and do the same, dialling in Start to something a bit more than 60. Choose part 4 and set Start to something greater than 90. You should now have four distinct sounds from one sample. You might notice that the pitch is not the same as the original file on the computer. That's because we cannot dial in exact multiples of the waveform. If this is an issue for you, fix pitch with the Speed control. It is also apparent that decreasing Length can also effect the pitch. This means that Speed, EG INT, and Length all interact in unexpected ways. That's why I suggest leaving Length exactly the same. It's one less variable to manage. Once you have set up an entire pattern of ten parts, your job is mostly done. This pattern can be saved to the second sequence. All the values stay the same, except the Sample number. This method gives us a total of 400 waveforms on one instrument. This should be plenty. You will quickly determine which are useful for your music. No doubt this method is only partially successful if judged against a "proper" wavetable synth. But it does demonstrate the flexibility of the Volca Sample, which can be used creatively far outside its use as a drum machine. This is an important characteristic of the best DEM tools. And it's a principle I would encourage all manufacturers to follow. Simply stated: Provide as many features as possible, even if you don't know how they might be used. Creative minds will follow!